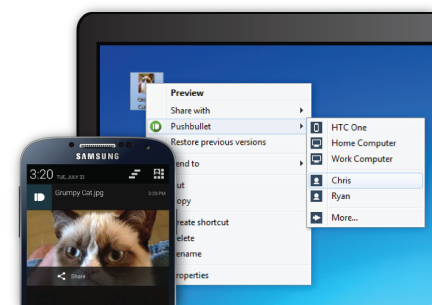 For several months now I have been using a program called Pushbullet. In a nutshell, it allows you to move files between your android/apple devices to your tablet and computer and vice-versa. I have been uploading photos automatically from my android phone to several cloud services; Dropbox and Google drive mainly. It’s nice as a fully automatic way of making sure that any photo you take is backed up to the cloud. But if I’m out and have taken a bunch of photos, that automatic backup process doesn’t really take place until I get to the office when I’m connected to a wi-fi connection. With pushbullet I can instantly select any photo, send it directly to my computer and it’s uploaded in a manner of moments. What’s has been real convenient is getting photos from my smartphone and computer onto my tablet. All I do is simply select the photo(s) and tell it to send to the tablet and it’s transferred very quickly. The only apparent drawback I see at the moment as being an all in one solution is the fact that you can only push up to a 10mb file. Many videos and podcasts that I download from the Internet are much larger than the limit. Another use which comes in real handy is when I’m sitting in the office I can receive notifications on my screen if I’m receiving a text or phone call. I can easily dismiss the notification and the cool thing is it takes the notification off my phone as well. The Windows application is in beta at the moment, but as I said, I love it and have had no problems sending files back and forth. For a good run down on some of the capabilities take a look at a recent Lifehackers Guide to Pushbullet post. Other sources to take a look at Hongikat, PHAndroid has some a few item like IFTTT recipes, if your using Tasker and how to create a quick to do list.